For some boaters, ‘Gone Cruizin’ means forwarding the mail and pointing the bow towards the horizon, with no calendar and no firm plans…an escape from everything ashore, plain and simple. For some, it can be a real-life antidote to the stresses of modern living. On Mosey On, we’re comfortably retired and most assuredly not stressed-out. The crew can hardly claim the need to flee…in fact quite the opposite! We strive to maintain our many connections, old and new, even as we set out to visit further north and south. This blog is but one tool to this end. But it is also part of our ‘Cruising Plan’ to keep connected face-to-face with family and friends as those opportunities occur – like these next few weeks. We’ve brought Mosey On back to her home port in River Dunes, NC for a ‘time out’ to attend to some very important connections…the wedding celebration of good friends, a quick trip by Colleen to visit an old friend, and a visit by both of us to daughter Shannon and her husband, who are expecting their first child later this summer. It’s also a good time to allow the temps further north to moderate some…and do some maintenance best done before summer’s heat and humidity kick in! Once we do get underway again (probably late May) we’ll be trying to coordinate with the schedules of some very busy grandchildren to get them aboard for some shared adventure. Critical connections for ‘gad about’ grandparents like us! Moseyin’ On …and we’ll be looking for you! We’re a little behind in getting this post out, be we’ve had a busy week. We got together with two other couples, old friends from New Hampshire, who had dodged this last New England winter by heading south as we had. One of the couples was watching the weather to resume their drive back home to New Hampshire. The following day we met an even older friend from my Air Force days who was in Beaufort to buy an airplane and fly it back to Michigan. He had been delayed a day on his way down in another pilot’s plane while waiting for weather in the Midwest to clear. Mosey On and crew were thoroughly enjoying the Spring weather in Beaufort, but at the same time eyeing the calendar and our commitments back in North Carolina. We have learned that while our sturdy vessel is well-founded and up to most anything, her crew tries to avoid being thrown about and is decidedly cautious. 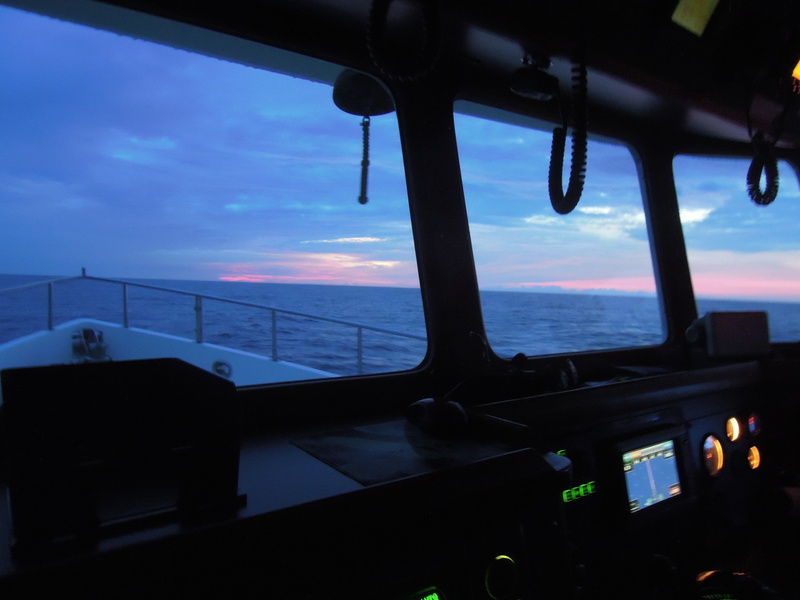 So…like our friend with the small plane, we were watching for our opportunity…a ‘window’ with enough hours of ‘benign’ seas offshore to get us from St. Helena Sound (SC) to the safe inlet at Morehead City, NC…..thirty-six hours of offshore cruising. As it happened, just such a window was forecast beginning Tuesday the 7th and lasting through Thursday….but with the weather router’s firm admonition to be In Port by Friday….In the Spring, these ‘openings’ don’t last long as warm air attempts to push north, but winter is reluctant to give up its grip. It’s a ‘tug-of-war’ with the mid-Atlantic coast as the playground. Mosey On was repaired and ready and her crew was rested…so we went for it! I should note that there was some trepidation over this trip owing to the simple fact that we had not attempted an overnight cruise of this length before….this was to be twice a far as our last summer’s cruise from Cape May, NJ up to New York. And the odd thing is…I’m not accustomed to having an engine run so long…the big John Deere in Mosey’s belly ran beautifully, and we carried enough fuel….it’s just a little unsettling. The trip was long…seemingly without end in the ‘wee dark hours’…and while the seas were certainly not calm, they were ‘benign’. We split the watch into 3 hours on – 3 hours off for each of us…….We would love to have shared the duty with one or two more crew! The view from the bridge (above) just before sunrise was from a perspective I’d never seen before (I don’t get up early to fish…). We tied-up in Morehead City near midnight. Exhausted, but proud of our planning and new-found confidence in cruising on Mosey On.